Those born between January 27, 1952 and February 13, 1953 are members of the Water Dragon Chinese Zodiac sign. The DRAGON symbolizes life, growth, and brings blessings of longevity, virtue and harmony. Dragon people are born extroverts, their opinions and ideas are worth listening to since their advice is usually the best. Elegant and with a good eye for spotting the latest trends, Dragon people are always to the forefront of the fashion scene. Blessed with rich imagination, the Dragon always comes up with exotic ideas for new ventures. a Dragon should choose a career as artist, doctor, or architect. The influence of the Water Element makes the Water Dragon the most calm of all the Dragon types. While still driven, the Water Dragon has a more reflective and emotionally intuitive personality. These qualities allow the Water Dragon to be less self-centered than others born under the Dragon sign. With more of an open-mind and ability to understand others opinions, the Water Dragon has the ability to be team oriented and cooperative. With these social skills, Water Dragons are known to have more friends and close companions. With their pairing of passion, communication and intelligence, the Water Dragon has a fluid path to success. The cooperative and driven Water Dragon is destined for success, so in this sense, their only challenge may be choosing which career path to follow. With gifts for communication and leadership, the Water Dragon may do well in management, business or owning their own business. SImilarly, their intelligence and perseverance could lead the Water Dragon to demanding fields like law, medicine or science. Members of the Water Dragon sign have been known to well in the world of entertainment. This can be seen in the long and varied careers of actors Patrick Swayze and Dan Aykroyd, who were both born in 1952. 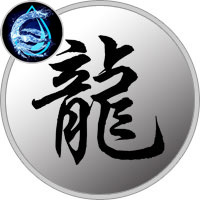 While the personality of the Water Dragon is full of positive aspects, members of the sign also have their downfalls. The Water Dragon can become too outwardly concerned and as result, can become to thinly spread. In these times, it is important for the Water Dragon to find balance between their personal needs and the interests of others. The greatest success for the Water Dragon can be found with clear, defined priorities and goals.